Whether you live on an expansive farm or in a cramped apartment, there are many benefits to starting an indoor herb garden. These range from always having fresh herbs on hand to the environmental benefits of having plants indoor. 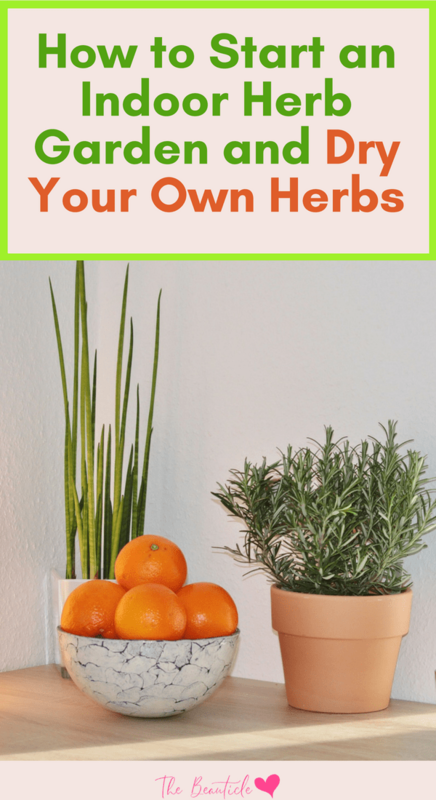 This article will expand on the benefits of growing your own herbs, reveal the best way to start an indoor herb garden and to dry your herbs plus some common herbs you can grow. Herbs are beneficial not only for making your food taste good but also for medicinal purposes. The dried herbs sold at the store are good for food but to get the best taste possible, fresh is always better. You can avoid paying the high costs of buying fresh by starting your own herb garden. Whether for medicinal or culinary purposes, herbs have been used for centuries, even before recorded history. Many ethnic and regional cuisines still use a variety of fresh herbs and spices for a healthy dose of preventative medicine with each delicious bite. Herbs are also quite healthy. Many people use herbs as an alternative medicinal source, especially in light of the high cost of prescription medications. Herbal remedies are thought of as alternative medicine today but just about all medicines can be traced back to plants, seeds, spices, flowers, herbs and roots. Purchasing common and unique herbs can cost you quite a bit. Besides the cost, already cut herbs, even fresh, will only keep for about seven days, some even less. Unless you plan on using all you buy right away, there will be some waste. Avoid the waste and the cost by growing your own herb garden. This can be done outside in a planting box or indoors by a window. You can create a balcony herb garden or use stands on a porch or patio. An indoor herb garden can be cultivated all year round. Inside the home, your plants are at less risk for pests, worms and damage due to weather. Whether you are trying to expand your culinary palette or create a more natural medicine cabinet, here are some tips for starting your own indoor herb garden. Many plants grow well indoors. As long as you have ample sunlight on at least one side of your home and a tiny bit of space, it can be done – even if you don’t have a green thumb. Decide what herbs you want to grow. Some are best placed in their own pots to avoid mixing the smells or tastes. For instance, chives have an onion flavor and might be too strong to grow next to mint. Use containers that are large enough to accommodate roots of growing plants with holes in the bottom and a pan underneath it for drainage. Most herbs come in small containers so you will need to re-pot them unless you’re buying seeds and starting from scratch. Fill the new pot about three-fourths full with a potting mix that contains fertilizer. Carefully remove your plant from the original container, gently shaking off excess dirt from the root ball. Cover the root ball with more soil. If using seeds, place you seeds in your pot about an inch down from the surface. Add water until the soil is damp but not too wet. Plant herbs with similar water requirements together in the same pot if you like. Place plants in a window that gets a lot of sunlight, at least eight hours. Place shorter plants in front so all get enough sun. In as little as four to six weeks, you can begin to harvest your herbs for medicinal and/or cooking needs. One way to preserve the herbs that you have so painstakingly grown is to dry them. There is more than one technique for drying herbs. We will discuss the options here so you can get the best flavor and oils from your leaves. Herbs are a way to add extra zest to foods without adding fat. If you’ve ever had cuisine with fresh herbs then you know the difference it makes. The next best thing is dried herbs. Here are a few tips that always need to be observed when you’re planning on drying herbs. Harvest herbs at their peak – Do you know when herbs are at their best tasting and most potent as far as oil is concerned? It occurs when they are getting ready to bloom. You will notice several buds but none will be open yet. Wait until after the morning dew has dried before cutting your leaves. Carefully choose your leaves – Look for healthy branches that are free of disease, damage or yellowing. Also , remove any insects that might tag along on the plants. This usually isn’t a problem for indoor herbal gardens. Wash your leaves – Remove any dirt and soil from the leaves. Use cool water and then dry with a paper towel, being careful not to rip or tear the leaves. Wet herbs will mold so make sure they are completely dry. Bunching – This involves hanging your herbs. Remove all leaves from the bottom of about four to eight stems. Bind them together gently with a rubber band or a piece of string. Place them in a paper bag with the stems protruding out. Tie the bag closed around the stems and hang in a warm, dry area. Poke holes in the bottom of the bag for air circulation. Tray drying – This is done for the leaves. Remove the stems and the stalks from leaves. Place the leaves in a single layer on a baking sheet or a drying tray. Large leaves can be cut into smaller pieces. Place in a warm area that is dark until drying is complete. Drying in an oven – You don’t actually turn the oven on when you do this. Gas ovens seem to work more efficiently with this method. Using a baking sheet again, place leaves in a single layer so they are not touching. Separate more than one layer with a paper towel. Dry overnight. Solar drying – This is not a very efficient method but may work for people who live in a very warm area. Place your leaves on a drying tray or an old window pane in the sun. In order for this to work, the temperature needs to be constant with low humidity (below 100 degrees F and 60% humidity). Avoid direct sunlight because leaves will fade. Store your dried herbs in a dry, dark place in airtight jars for up to one year. Drying fresh herbs can keep your food full of flavor all year round. Not sure what herbs to start with? Here’s a list of some common herbs and their uses. Let’s start with culinary herbs. These herbs are perfect for complementing a lifestyle of clean organic eating. You can also use these herbs to spice up your ketogenic diet meals. Now for a look at some herbs used to cure or aid common ailments. You’ll notice some culinary herbs doing double duty. Rosemary – Improves memory and blood circulation.